Sonia De Los Santos will bring her positive, multicultural, family-friendly music to Pepperdine University's Smothers Theatre during the spring 2018 Family Arts Fest on Saturday, March 3, at 11 AM and 1 PM. Family Arts Fest will include face painting, Weisman Museum tours, backstage tours of Smothers Theatre, and food available for purchase at some of Los Angeles' most popular food trucks. Hailed as “one of the Latin Children’s music artists you should know” (Billboard), Santos was born and raised in Monterrey, Mexico, and later immigrated to the United States from Nuevo León, Mexico, on the Texas border, to New York and points in between. She studied musical theater at Circle in the Square Theater School in New York City and holds a bachelor’s degree in communications from the Instituto Tecnológico y de Estudios Superiores de Monterrey. Since 2007 Santos has been touring the world, singing in English and Spanish, playing guitar, mandolin, and jarana, and lighting up the stage with Grammy Award-winning group Dan Zanes and Friends. 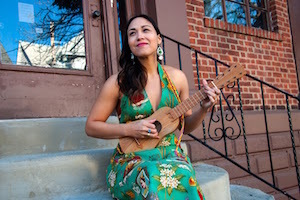 In 2015 she released her first solo family music album titled Mi Viaje: De Nuevo León to the New York Island (Parents' Choice Foundation Gold Award Winner), a collection of songs that reflect her experiences growing up in Mexico, moving to another country, learning about other cultures, and in the process, feeling closer to her own heritage. This unique collection of old and new songs, which includes lullabies, ballads, and mariachi music, is a personal, and yet universal, musical story from this soulful and important new voice in family music. De Los Santos’ messages of joyful community, music making, and cultural bridge-building inspire and excite children and grown-ups of all backgrounds. De Los Santos’ music has been featured on NBC’s Visiones, Sirius XM’s Kids Place Live and WXPN’s Kids Corner, among others. She has also made numerous appearances as a singer and guitarist on TV shows like ABC’s Good Morning America, CBS’s The Early Show, and Sprout’s The Sunny Side up Show. Event tickets are $5. A full schedule of activities and artists will be available prior to the event through the Center for the Arts website.